Molecular machines play many essential roles in the cell, such asmaintaining the genome. Characterizing the atomistic-level mechanism for thesecomplex machines, though challenging, is crucial to link protein structure withRPPR function. 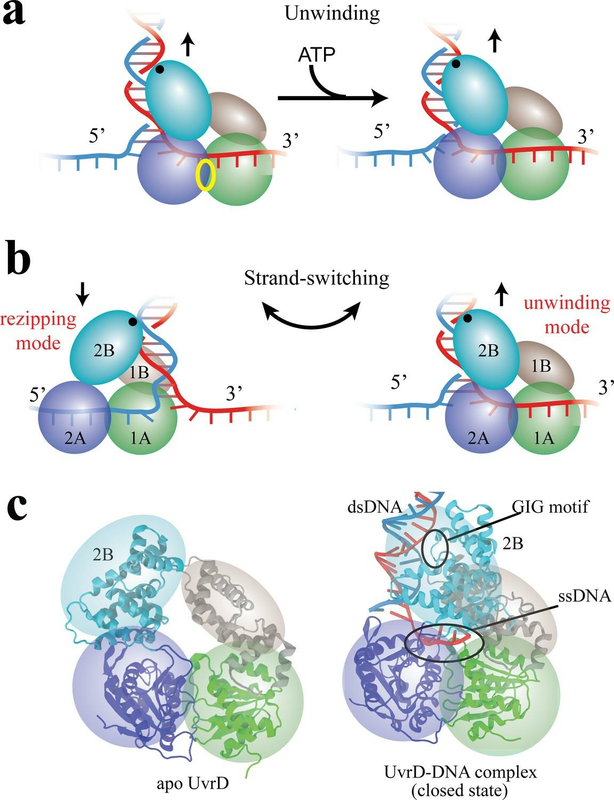 Previously, single-molecule experiments by the Ha and Chemla groups demonstrated that the DNA repair helicase UvrD can switch its activity dramaticallyby changing the conformation of its regulatory 2B subdomain (Comstock et al., Science, 2015). However, the structural basis and driver for this functional switchremained unclear. CPLC postdoc Wen Ma from the Schulten group, in collaboration with Luthey-Schulten and Chemla, employed a novel computational approach to study the molecular mechanism of this functional switch, integrating enhanced sampling MD simulations with bioinformatics tools that survey structural information from homologs. The simulations predicted a new molecular structure responsible for one of UvrD’s functions, as well as an important metastable state that plays a crucialrole in switching the helicase’s function. In addition, simulation results were validated by comparing simulated FRET efficiency distributions for the predicted structures withthe experimental measurements, showing excellent agreement. Finally, a physical model combining the free-energy simulation results and the measured equilibrium constant from experiments explains how UvrD-like helicases switch function. Referto: Ma et al. eLife (2018).